Thinking about skincare is not something I have personally paid much attention to over the years, other than being sure to remove make-up at the end of the day and use a moisturiser (whatever is in the cupboard) but that’s been about it. I’ve always thought that I just have naturally bad skin – but is that really the case? Apparently not according to the team of Dermalogica Skincare Experts at Options Beauty Salon, it just needs the right treatment and products, and I need to develop a proper skincare routine. Anita Black, owner at Options, set me up on a “results driven” skincare package which began with a series of three facial treatments. If you already have facials then I’m sure you’ll know exactly what I’m talking about through each step of my journey but I’m sure there are also many of you, like me, who have never even tried it so this is for you. 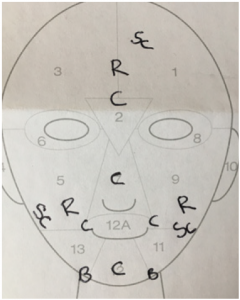 At the very start of the process my skin was analysed through a magnifier and a ‘face map’ created to identify my problem areas that would need attention. You can see the Redness, Congestion and Scarring all noted down. This helps the therapist tailor the individual elements of the procedures to suit my requirements. 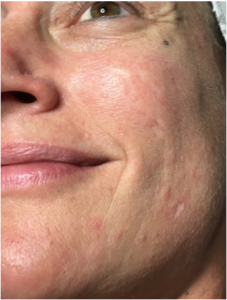 I had lots of questions throughout the process and I began to understand a little of the ‘science’ behind the treatment which all seemed quite logical – I just never thought of skincare in that way before. The very lumpy bumpy picture (left) clearly shows that my skin is not great – so will this really work? My first treatment saw me having steam blown across my face to open my pores to allow for the oat and enzyme exfoliant to deeply soothe my skin and remove dead skin (the oaty smell reminded me of porridge). I then had a scaling fluid applied to bring any blackheads to the surface which were gently removed by my skin expert. All the products are individually mixed just before use and tailored to help achieve the results I’m looking for. Towards the end of the session I had a relaxing face massage – it really had been a super hour but would it make a difference? The most noticeable feeling was of freshness and lightness. The redness had reduced and even the lumps and bumps were not like they had been. I’ve always been used to having blackheads and it was strange to not see any – I can’t remember the last time I had seen that. I wasn’t even worried stepping into the street afterwards, something I don’t normally do unless I’ve at least put on some foundation. In fact I was so impressed that I did buy a cleanser so I could make sure to clean my now clear pores daily and at least help myself along this journey. 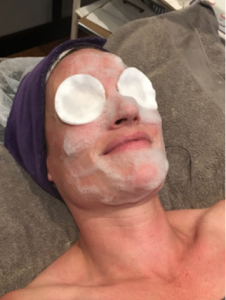 My second and third facial treatments, a week in between each, followed the same process, the only difference being that the treatment was taken up a level with a slightly stronger blend of products. This is where it starts becoming more results driven and not simply a pamper session. It was also preparing my skin so I could move on to the next stage of treatments. 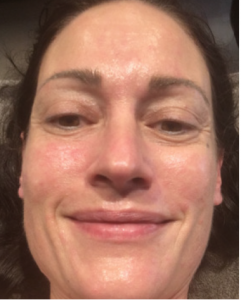 By the end of the third treatment my skin was feeling really great and I found myself not even bothering with make-up most of the time (apart from a bit of lippy). I was certainly very impressed. So where does it go from here? This type of facial is even more results driven than the previous ones and gives longer lasting results as well as penetrating even deeper into the skin. 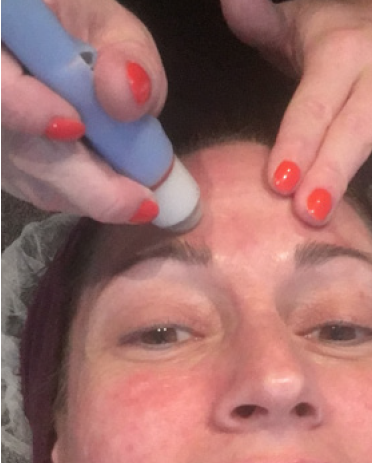 As part of my specific treatment I also had microdermabrasion which I have to say is one of the most satisfying things I’ve ever felt on my face. Technically this machine “delivers liquid cooled diamond peeling with vacuum stimulation and product infusion.” I call it the face vacuum – it’s like cleaning your rugs with those machines where you see the water washing into the rug and all the dirty water sucked out after it’s been through collecting all the dirt. It feels so soothing and satisfying, clearing all your dirty pores at such a deep level. You can also have this treatment done separately. The final part of the treatment is a hot or cold stone massage, not only relaxing but of huge benefit to the skin. 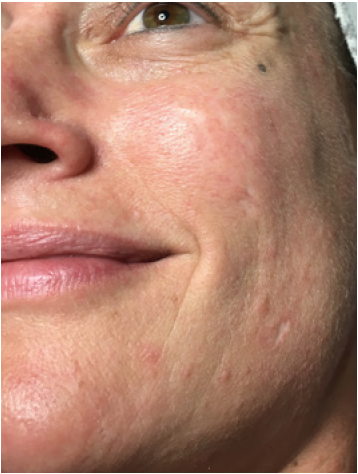 My therapist was happy that my skin would now be able to handle the power of the BioSurface Peel following the other treatments I’ve had. The day before I used a hydration mask which I had been given to help prepare my skin prior to treatment. This is a chemical peel designed to resurface the skin with minimal recovery time. 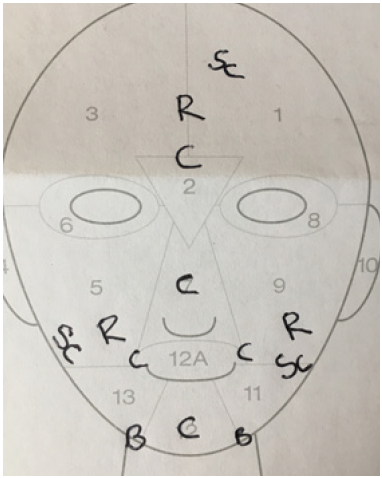 This was also to be where I would see the maximum results – scar reduction, reducing acne and leaving me with smoother, brighter skin. I remember meeting a lady a few years ago who had recently had a face peel and I remember being horrified as strings of skin were falling off her face. 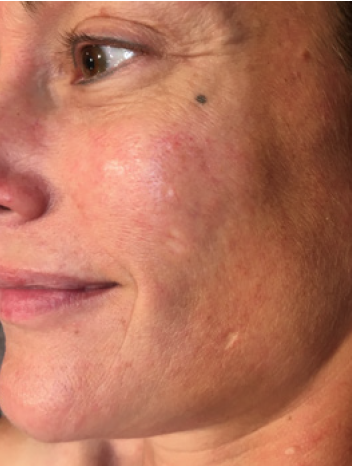 Luckily the BioSurface Peel works differently. It will still give you powerful results but because it is non-abbrasive it gently removes the dull surface layers and promotes the regeneration of the skin underneath. It is applied in layers, one on top of the other, waiting a few minutes in between. You can feel a tingling as it starts working on the skin. 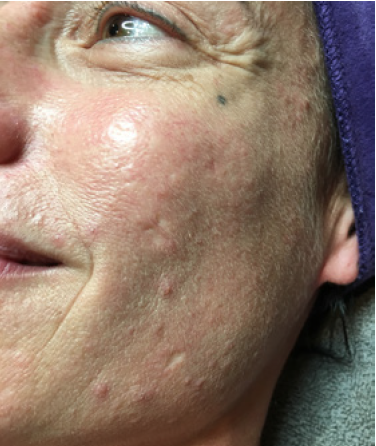 Throughout the treatment I was asked if I had started feeling any discomfort and if I did, the peel would be removed immediately. Following the peel I was provided with an aftercare kit and strict instructions to follow. I did experience some dryness and tightness but following the instructions helped clear that up quickly. So, has it made a difference? A resounding YES – I’ve never actually felt confident about my skin but now I will leave the house without any make up and not worry. I know that I will have to keep up with my new skincare regime but it’s not that difficult. I know my scars are still there but the bumps are like a distant memory! You can see how much smoother my skin is now in this picture. A huge improvement to how I was at the start of this process. 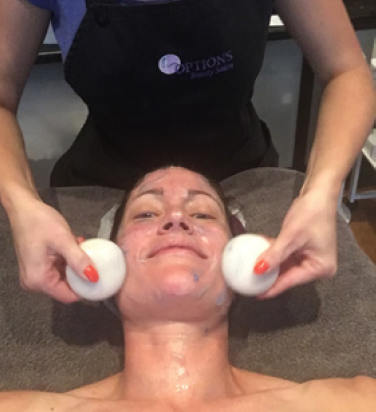 If you want to find out more about skincare treatment packages at Options Beauty Salon, call 01732 864 635, visit www.optionsbeauty.co.uk or pop into the salon at 40 High Street, Edenbridge, TN8 5AJ.